Boodler is an open-source soundscape project which I invented years ago. Boodler is designed for any kind of complex audio environment -- weather, traffic, alien worlds -- but I've never developed it as it really deserves. The Pocket Storm is my first attempt to bring Boodler to a consumer audience. Rather than trying to sell a complete "Boodler for iPhone" app, I'm taking the approach of do one thing, very well. 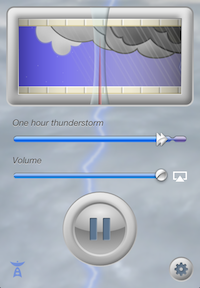 So Pocket Storm is a one-hour thunderstorm, which plays as background audio. Or you can stream it to AirPlay. You can set the timing as desired, or adjust the weather manually. There's also a timer option, if you want to go to sleep to it. Audio samples from Pocket Storm, at different stages, are posted on the web site. Owen Williams created the first Boodler thunderstorm soundscape, more than a decade ago. My app doesn't use his code, though, nor the old Boodler sound samples. I've built an all-new thunderstorm -- or rather, a set of thunderstorm variations -- using sounds from the Freesound.org project. The sound libraries that I've compiled for Pocket Storm are now posted on the Boodler web site. (They're all Creative Commons Attribution, Sampling Plus, and Zero licenses.) The agents (source code) that assemble the sounds are not currently available; as usual, I'm trying to find a balance between open-source work and secret sauce. But you are, of course, welcome to compose your own Boodler thunderstorms from these sounds, or use Owen's original. Looks good so far: a delightful wallpaper for the ears, for those who are into that sort of thing. But if you decide while a storm is in progress that it isn't quite right, is there a way to produce a change in the weather? (Nicely put.) Yes; if you pause the sound for a moment and then unpause it, it will start a new "track" and randomize the sound choices.